We are a community of scientists and educators interested in what controls long-term climate evolution. 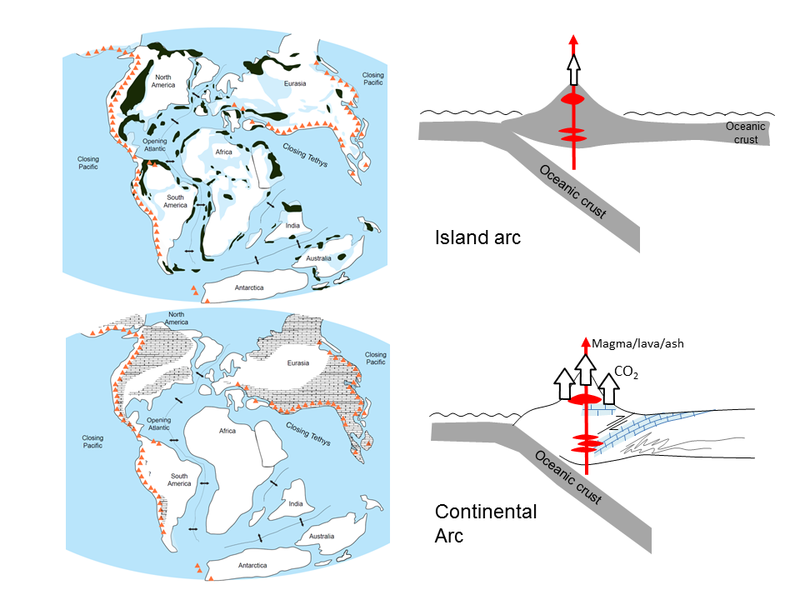 For example, why was the Cretaceous and early Paleogene warm and ice-free, and why has the latter half of the Cenozoic been relatively cool and characterized by ice caps covering at least one of the poles? It is generally agreed that these long (>10 My) time intervals of warmth or coolness are controlled by the amount of atmospheric carbon dioxide (CO2), a greenhouse gas. Thus, the key to understanding what drives long-term climate variation is in understanding why atmospheric CO2 levels vary over the long-term. This requires that we understand how carbon cycles between the Earth’s interior, atmosphere, oceans and biosphere. The timescales of carbon cycling between various reservoirs and sub-reservoirs can vary from days to millions of years. Cycling within exogenic reservoirs, such as that between oceans, atmosphere, biosphere and soils, operate on daily to hundred thousand year timescales, whereas cycling between the deep Earth and the exogenic system operates on million year timescales. Thus, carbon cycling in the exogenic system is typically modeled independently from deep Earth cycling. Coupling between the deep Earth and exogenic systems, however, may be far more important than previously recognized. The purpose of this community is to revisit climate evolution from a more holistic point of view, treating the entire Earth, from the core to the atmosphere, as a fully coupled system. In so doing, we are naturally also looking at other volatile cycles, particularly the oxygen evolution of the Earth’s atmosphere through time as this is distinctly coupled to the carbon cycle. We are also studying interplays between magmatism, erosion, and chemical weathering, with implications for the formation and destruction of continents, the nature of volcanism, and the evolution of the sedimentary rock record. Lenardic, A., Moresi, L., Jellinek, A. M., O’Neill, C. J., Cooper, C. M., Lee, C.-T., 2011, Continents, supercontinents, mantle thermal mixing, and mantle thermal isolation: theory, numerical simulations, and laboratory experiments, Geochemistry, Geophysics, Geosystems 12: Q10016; doi:10.1029/2011GC003663. This work is funded by a generous grant from the United States National Science Foundation, specifically a Frontiers of Earth Systems Dynamics Grant from the Ocean Sciences Division. Our base is at Rice University in Houston, Texas, USA.